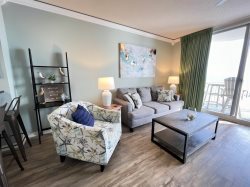 Magnificent views abound in this 14th story Summerwind condo will make you "Absolutely Shore" you want to stay here. With plenty of seating and beds for everyone, this will be a great place to stay for a relaxing beachside get-a-way. No detail is left undone and your sure to enjoy the home's lovely features including a private Gulf front balcony, ocean views from the master bedroom and fully equipped kitchen. Accommodations in this condo include a king in the master, queen in the second bedroom, and two twin beds in the bunk room to comfortably sleep 6. This unit is also handicapped accessible. I've never stayed in a facility with a layout quite like this one. The fact that there were so few rooms on each floor was really nice. It was far less crowded than I was expecting as a result. I like the room layout, the condo layout and I also liked that the three pools were accessible. So if one pool was empty but there were 15 people in another, I could easily walk to the empty pool. The beach access was nice, and the facilities were well maintained. Overall it was a great place to stay. I would probably stay there again. I drove to Destin or Fort Walton for dinner most nights, but my favorite meal was from Johnny Huston's just down the road in Navarre. The staff was very helpful. We arrived earlier than expected to Navarre. After an 11 hour drive, I was worried we would have to wait hours to check in. The staff was happy to let me come in and sign all the paperwork and they called as soon as the condo was cleaned. The timing was perfect because they called us just as we were finishing our lunch at a local restaurant. We couldn't have been happier to begin to get settled in on our vacation! The property was very well maintained. It's a very family friendly spot for a vacation. We left items on the beach while we went to the condo for lunch each day and our things were never disturbed. The pools and hot tubs were a nice bonus and we really enjoyed the gift shop located on the property as well. I can say enough positive things about our stay. We just left less than a week ago and we're already planning our trip for next year! We have always had a great experience when speaking with the staff. They are always friendly, helpful and respectful. Loved that every unit had beach/gulf front balcony. Able to watch dolphins from balcony. Enjoyed walking on beach & pier. Appreciated that there were restaurant & bars within walking distance to property. We thought we would be there right after 3 to check in and when it got close to 4:30 they called my cell phone to check on us to see if we needed after hours pick up. It was the most relaxing and fun vacation I have had in a long time. It was what a vacation should be. We have used Navarre properties at Summerwind for 4 years now I believe. That are always friendly and helpful. Our stay was great just not clean when we arrived. The only other thing was you should have some sort of stereo or music I'm condo. Everyone at the front desk was very curtious and efficient. One man that worked out at the pool was not so nice to one of our guests because he didn't have a wrist band on. It was our second time staying, I know we will be back agaihn. It would be helpful if there was a computer to use to print out plane tickets, other than that everything was perfect! Thank you.